Did the Marchessa Carvello guess what might be going on under the palazzo roofs, or the evil which threatened to descend on the ancient family whose roots lay in blood long dried, whose future now lacked permanence? Longing to escape the dull familiarity of her father’s home in England, Harriet agrees to go to the great Carvello palace in Italy to take her cousin Ann’s place as governess to the Carvello children. But how could Harriet know she would be thrown into the midst of strange and frightening events, and herself be involved in the tragedy that haunts the Carvello family…. Written by Frances Cowen. First Ace printing 1973. Ann Mannering is in Italy working as a governess for the Marchesa Carvello. The Carvello family are incredibly rich and live on a huge estate, built on the site of an ancient castle, a few kilometres from Milan. Ann is not happy; she has spotted trespassers lurking within the Pallazo grounds and feels threatened. She wants to leave – the sooner the better – so she makes a few calls, throws herself at the mercy of the Marchesa and in no time has arranged for her cousin, the recently widowed Harriet, to come over from England to take her place. Enter our heroine, Harriet. Everyone tells her she is very pretty and the children adore her. But soon tragedy strikes when her cousin Ann is found dead, killed by a blow to the head and it is left to Harriet to uncover the deadly secret surrounding the Carvello family. 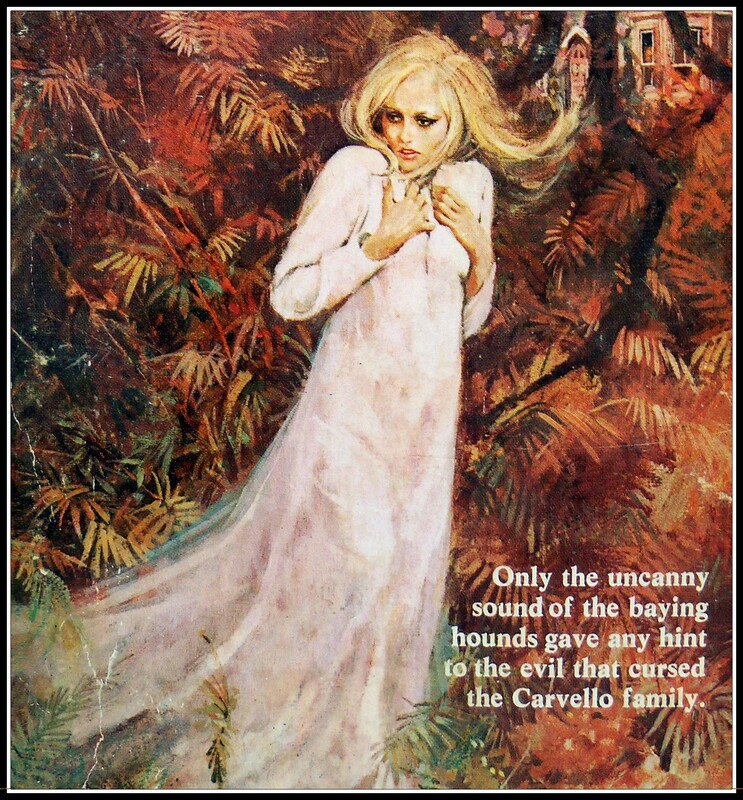 Hounds of Carvello started out quite promising and reads very well as an adventure/romance, since most of the story is taken up by Harriet’s blossoming love affair with the tall, dark and deadly Niccolo. Unfortunately – apart from some uncanny howling early on in the story and the odd murder or two – there is nothing much gothic about this title. Lovely cover though. Two out five stars.